Flag football for boys and girls aged 6 -14! Open to all skills levels! Whether your new to flag football or you’ve got a few touchdowns under your belt already, this game is fun and competitive for everyone! Children learn teamwork, discipline and sportsmanship. Best of all it’s fun! T-shirt and Flag belts provided! 7 games plus playoffs! 1 hour practice + 1 hour game on Saturdays between 10am - 3pm. 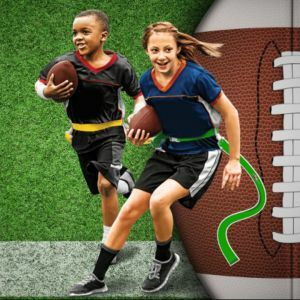 Flag football provides the best opportunity for skill development, learning football fundamentals, emphasizing proper technique over physicality and learning to make plays. It's a great way to learn team work, in a safe, non-contact environment. Why Play Predators Flag Football ? Flag football gives every child the chance to be an impact player and learn multiple positions. Kids of all sizes can throw and catch the ball, make interceptions, pull flags on defense and run for touchdowns – all while having fun, making friends, and staying active. Children learn football skills while understanding the importance of maintaining good form and footwork. Flag football provides more playing time, more involvement in the action and a greater coach-to-player ratio. In one flag football game, with much smaller player rosters, they are going to get alot of opportunities to touch the ball and make plays It teaches players the proper way to run a route and what happens when everyone does their job at the right time. Flag football is a non-contact sport that also requires the same focus and concentration as traditional tackle football. This gradual progression of skills ensures optimal athletic and tactical development. A common question we hear is "What about the bigger kids or linemen? How do they benefit from flag football"? Our answer is that flag football is for players of all sizes and abilities. Every player can benefit from focusing on proper form, technique and staying active. With flag football, players of all sizes can develop important football skills on both sides of the ball, as well as learning strategy, reading plays, and building self confidence. Football Canada's Long -Term Athlete Development Model has also determined that it is essential to develop broad-based skills and abilities before specializing in one position. All coaches are volunteer parents and we need your help! If you're interested in volunteering to coach one of the Predator Flag teams, there is an area on the online registration form where you can select Yes or No to the volunteer coach question. The time commitment required is very low as practice is on the same day as the games. We provide all the play books as well as assistance in the skills and drills to teach the players. For those players who are interested in registering for tackle football in the Fall, we will also be providing some optional tackle practices, with equipment, at no additional cost, one evening a week towards the end of the flag season. Stay tuned for further details on days, time and equipment pick up. Check Out the Highlights of Champ Day 2018!